Workbench’s intuitive interface makes it easy to set up and run a simple format-to-format (&apos;quick&apos;) translation. The Generate Workspace dialog condenses all the choices to be made into a single dialog box. It has fields for defining the format and location of both the data to be read, and the data to be written. 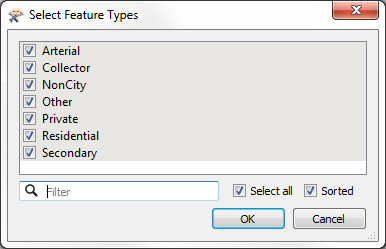 All format selection fields in FME are both a pull-down menu and a text entry field. The text entry field allows you to type a format name directly. It has an &apos;intelli-complete&apos; function that selects close matches as you type. 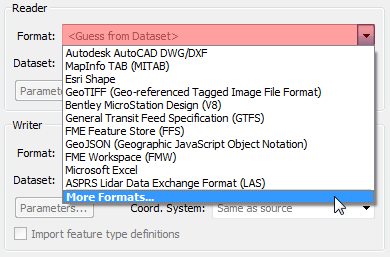 Format selection can also be made from a table showing ALL of the formats supported by FME. To access this table, select &apos;More Formats...&apos; from the foot of the drop-down formats list. Dataset selection fields are a text entry field, but with a browse button to open an explorer-like dialog. Red coloring in an FME dialog indicates mandatory fields. Users must enter data in these fields to continue. In most dialogs the OK button is de-activated until the mandatory fields are complete. Here&apos;s a question you can&apos;t answer with &apos;a&apos;, &apos;b&apos;, &apos;c&apos;, or &apos;d&apos;! 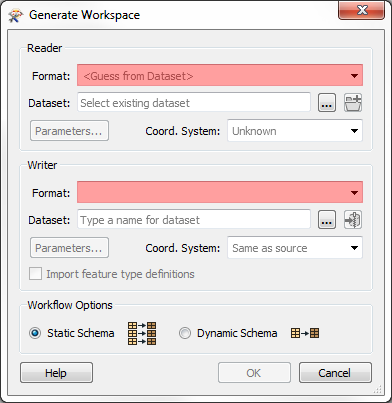 In the Generate Workspace dialog, why might it be useful to set the data format before browsing for the source data? Try browsing for a dataset before setting the format type and see if you can detect the difference. Did you get it yet? Clicking OK on the Generate Workspace dialog causes FME to generate the defined workspace. However, whenever a source dataset contains multiple layers the user is first prompted to select which are to be translated. This is achieved through the Select Feature Types dialog. In FME Feature Type is another term for layer. Only selected layers show in the workspace. Here, for example, is a Select Feature Types dialog where the user has chosen to include all available layers in the workspace.